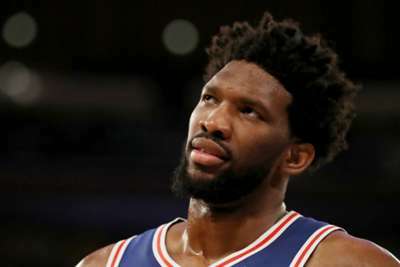 Joel Embiid credited Marcus Smart's moment of madness for helping the Philadelphia 76ers to come from behind and record a memorable victory over fierce rivals the Boston Celtics. Celtics guard Smart was ejected early into the third quarter at Wells Fargo Center on Wednesday after pushing Embiid to the ground. Smart was angered when he appeared to be caught by an elbow from Embiid, but his reaction – shoving his rival in the back – led to officials awarding a flagrant foul two and ejecting the Celtics man. The 76ers had been 69-58 behind at half-time but, following Smart's exit they rallied to claim a 118-115 triumph - Embiid finishing with 37 points, 22 rebounds and four assists. And he said Smart's actions had helped galvanise Philadelphia to record their first win of the season over Boston. "Yeah, for sure, stuff like that gets me going," he told reporters. "It gets the crowd going and everyone knows that I play better when the crowd is involved so that energy was definitely good for us. "Obviously I was frustrated because it was a cheap shot. "I didn't see it coming, it caught me off guard but I don't really want to talk about him, I don't care." Embiid feels the victory – Philadelphia's sixth in a row – sets them up nicely for another shot at the playoffs, the 76ers having lost to Boston in the postseason last year. He added: "It was good to get this win. In the first we went down by about 15 but to see us fight through it and get back in the game was a great step towards what we're trying to build here."